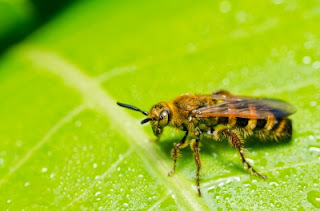 Wasps are around in the summer, and if you see a lot of them you may have a wasps nest nearby. Be careful before you take any action as the stings hurt a great deal and could cause severe allergic reactions. If you think Queen Elizabeth II is hard working she has nothing on Queen Wasp. When winter has finally given way to spring she is set the lonely and unforgiving task of building a nest. Assembling from wood she finds from fence panels, garden sheds or even window frames, she chews this wood over and over until it forms a paste. It is from this that she will construct the nest. Who knew wasp spit was so versatile. The first signs you might have a wasp nest developing in on your property are white lines on said wooden structures. There are various locations where you might find a nest, sheds and lofts are common but even a hold in the ground is sufficient. The next decision for the queen is where exactly to construct the nest. It needs to be a solid and sturdy place. Soon she will build the centre of the nest, a stalk on which she will add cells, within which she will lay eggs. This is not a time for her to relax though, now she must find food to feed the larvae as they hatch. It is only when her creations are old enough that she can allot the job to her underlings. Most of us know what a bee's nest looks like from various cartoons, a wasp nest is similar but concrete coloured. It starts out around the size of an egg (a chicken's egg that is) but can grow quite large, the largest recorded in Great Britain was a horrifying six by five feet, hopefully this metropolis of the wasp world will not be something you have to deal with. A good way to determine if what you are looking at is a nest is the swirling pattern around its outside. Wasps will come in their numbers if you are eating or drinking sugary foods and drinks, this cn be very annoying. A wasp nest can be dangerous, especially if it has fully developed, so it might well be best to get help. The Council will help if the wasp poses a risk and often you can obtain emergency protection policies. This is also a good place to start if you need advice. We don't want any heroes! Again it must be stressed that tackling a nest should only be done if you are absolutely sure it poses no risk to your health. Make sure you are wearing protective clothing, especially over the face. Do not attempt to dislodge a nest while up a ladder, you do not want to be stung several times while hanging perilously high in the air. Make sure you have an escape route planned if needed, wasps are extremely protective over their nests, they will be relentless in warding off any foe, including those as large as humans. Once you have rid yourself of the wasp nest, or even if it has died out come autumn, you can rest assured it won't return. Wasps may be aggressive and annoying but they can take a hint. If you need to find out about wasps control then you need Envirosafe pest control. We can help you get rid of any unwanted pests.